"Everyone was up and dancing for the whole time you guys were playing "
Want to hire a great live band to play at your Wedding, Works Christmas Party or your event? Paul plays regularly around the Oxfordshire area and surrounding counties with the band SUBWAY BAND and the duo SubZero. They are one of the south's most sought after wedding and functions bands. 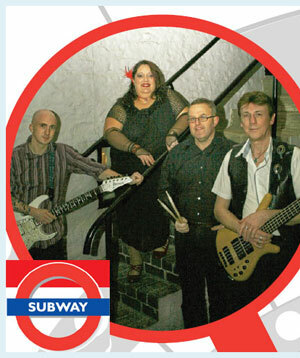 Visit www.SubwayBand.co.uk to see where Subway are performing and to book them for your party. Subway are a great covers band and have been established since 2003, we are taking bookings for this year & beyond. Subway add new songs to their song list or catalogue all the time, rehearsing every week to ensure a professional presentation. Subway can learn your special "our tune" to truly personalise your event. We can perform live music for your themed party - 60's, 70's, 80's, 90's eras all catered for.